BasX A-300 is a two-channel power amplifier offering double the power of A-150 with class A/B amplification and range of connectivity options. Earn 529 loyalty points when you order this item. 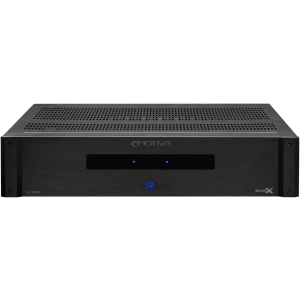 - Dimensions (WHD): 17" x 4" x 15.5"
Emotiva BasX A-300 is a two-channel power amplifier that offers true audiophile sound quality at an affordable price. The BasX A-300is full of important features, such as the heavy-duty power supply, the high-quality Class A/B amplifier, fault protection that is transparent, an input and output trigger, plus unbalanced audio inputs, that confirm to industry standards. The BasX A-300 has a full 150W per channel, with total harmonic distortion (THD) less than 0.1% into 8 ohms; the THD+N is less than 0.02%; and the SNR (signal to noise ratio), of 120 dB when referenced at full power. Therefore, the BasX A-300 is an all-round amplifier, which will be a solid foundation for an audiophile level stereo Hi-Fi system, to provide power for front main centre speaker in a surround sound or home theatre system. The A-300 has been created from the idea to be able sound fantastic, irrespective of musical genre, or the audio system it works with. The A-300 utilises a Class A/B output stage which produces a smooth, detailed sound and with a naturalistic auditory imaging, without any evidence of stress. The amplifier is designed to perform over a wide frequency band, with low noise, so the listener hears even the subtle nuance of a recording, even with high definition sources. The power supply is linear and heavy duty, due to the oversized toroidal power transformer it has sufficient power for even the most hungry speakers. The components and the construction of the BasX series have been chosen to give you years of reliable trouble-free service. The chassis is also heavy duty, constructed from steel 3RU with a machined aluminium faceplate, which give a rugged look of the amplifiers well as offering strength. The circuit boards are double-sided FR4 with designed to optimise the signal path and reduce the need for point-to-point wiring. You do not need hurt your bank balance, to enjoy BasX products, and you do not need to be an audio engineer to set up and use the units. They have all been constructed to provide you many years of reliable and trouble-free service, plus, they are a stylish addition to your living space or on your Hi-Fi rack. It is possible to build an entire HI-Fi system for just BasX units that will provide you with a true audiophile listening experience. Alternatively, add one or a couple of BasX units to your existing system to improve its overall sound. The terminals on the A-300 are industry standard unbalanced inputs RCA connectors, which will happily accept standard unbalanced interconnects. The speaker binding posts are versatile, being five-way heavy-duty and insulated, so you to use a wide range of speaker connections, such as standard banana plugs, bare wires, or lugs. The remote trigger input and output allow the BasX A-300 to control and be controlled by other trigger-enabled equipment. It is designed to operate on either 115 VAC or 230 VAC at 50/60 Hz and automatically detects and configures itself for the proper line voltage. The BasX A-300 offers lots of performance, and setting it up is a highly simple process. The BasX A-300 is supplied with a heavy-duty power cable (industry standard IEC), so you just plug the cable into a power outlet, connect a preamplifier or processor, your speakers, and you are ready to enjoy your music. The BasX A-300 is a smart device it will understand your line voltage automatically and change accordingly. The connections are industry standard and will enable upgrades to the power cable or speaker cables. Its better than average amps in this price range if you are looking for a warm sounding class-AB power amp with lots of bass. Construction like a tank iron case heavier than looks. Power rate is honest. But minimum output impedance is 4ohm, not suitable for your loved 3-ohm-minimun-speakers like Dynaudio, etc. sound is dynamic and powerful yeah but also has than, lets say, boring sound of poorly designed american made in china class_AB amps that make me always prefer my night to day better Hypex Ncore power amp!